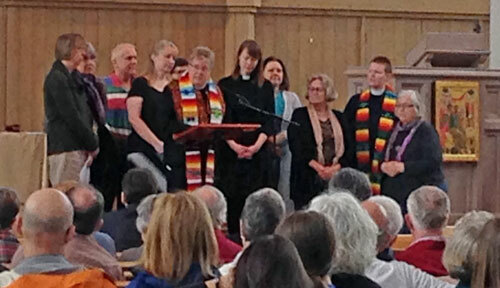 Surrounded by 200 people of faith and good will, three congregations made public their sanctuary commitments to hospitality and accompaniment of immigrants and refugees: Gethsemane Lutheran, St. Matthew/San Mateo, and Saint Mark’s Cathedral, at the Re-Launch of the Sanctuary Movement on May 1 at Saint Mark’s Cathedral, Seattle. The Re-Launch included prayers from representatives of the Jewish, Muslim, and Christian communities; a Litany to Prepare the Sanctuary of our Hearts; testimonies from three people sharing the need for sanctuary; the commitments of the three congregations; messages of support, solidarity, and encouragement; and song. Hearts were broken open with greater capacity to stand on the side of love, to give ourselves to love and to be changed and transformed by love. For, in the end – we asserted by our presence and convictions – love wins. A renewed understanding of sanctuary: upholding sanctuary means to build on historical and recent sanctuary efforts, rooted in the hospitality of faith communities. People of faith and faith communities are called to welcome the stranger as neighbor and to stand together with people who are targeted, vulnerable, and/or fearful. Our traditions are motivated by breaking down barriers to human relationship, “standing on the side of love”: to provide companionship and hope, and – as a matter of justice – to change unjust policies, practices and narratives that least to dehumanization, persecution and even in some cases, death. For people subject to the dehumanization of detention and deportation and the dreadful separation of families, parents from children, we are charged to embody solidarity through sanctuary and to live out the call of the faith community: alleviate suffering, remove fear and humanize situations of injustice. As an expression of religious freedom, this response is an act of compassion and active accompaniment of hosting individuals and families who seek relief and refuge and are partners in seeking justice. In so doing we are called not just to provide sanctuary but to be sanctuary. We are one community, together, in this liberation movement. Sanctuary, for our faith communities, is the declaration that, in embracing people who are vulnerable to deportation, hope remains alive as it is embodied in action. Sanctuary is a moral expression of faith, a reflection of conscience, a communal welcoming of the immigrant neighbor at our door. In so doing, we honor a higher law. Free us from our complicity. We will act justly, love mercy and walk humbly with our God. The Re-Launch can be viewed on Saint Mark’s YouTube channel. There was also a KUOW story by Ruby de Luna and an article by Joel Connelly. Is your faith community interested in supporting immigrants and refugees? The Church Council is walking with congregations in discerning their role, whether it manifests through offering resources of space, time, or talent; through direct service, networking, or advocacy. Contact Michael Ramos at (206) 525-1213, ext. 102.